As much as I loved to watch Heston Blumenthal in Search of Perfection, I didn’t really feel like trying any of his recipes. Maybe because I’m not British and I just don’t care about bangers & mash, fish & chips or chicken tikka masala. Or because I don’t want to go through so much trouble creating something that will still taste like something familiar, something not so exciting. I want to try new things, new combinations and new ingredients. Okay, not three full days and I had more or less doubled the quantities, but still, it’s not a quick recipe. And trust me, it’s not just me, there are others that have gone before me. On day 1, in the evening I deboned and minced the oxtail. 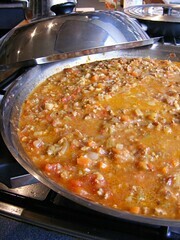 On day 2, I chopped all vegetables and made the meatsauce and tomato compote, especially the chopping took a long time. I even have a blister from cutting all these vegetables! On day 3, late in the afternoon, I combined the two, simmered it for another 2 hours and finally ate it. I’ve written down exactly what I did, but you can find the original recipe written down here. Finely slice the onions. (or misread and dice them instead, like I did) Place a large, heavy-bottomed frying pan over a medium heat for 5 minutes. Crush the star anise and bag it up in a square of muslin. (I didn’t) Add this to the pan, along with 25ml oil and the sliced onions. Cook for 20 minutes, or until the onions are soft and caramelised, stirring occasionally. Set aside. 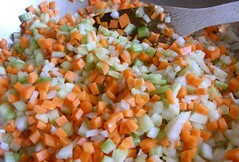 Finely dice the onions, carrots and celery. Mince the garlic. Preheat another large, heavybottomed frying pan over a low heat for 5 minutes. Pour 50ml oil into the pan, then tip in the garlic, onions, carrots and celery and cook this soffritto over a medium- low heat for about 20 minutes, or until the raw onion smell has gone. Transfer the soffritto to your preheated crockpot and wipe clean the pan. Place the pan over a high heat for 10 minutes. Pour in 50ml olive oil and wait until it starts smoking: it must be hot enough so the meat browns rather than stews. Add the minced meat. Stir until browned all over. (To brown properly, all the meat has to touch the surface of the pan. If it doesn’t, do it in batches.) Tip the browned meat into a sieve over a bowl (to allow the fat to drain off), then transfer the meat to your crockpot. Deglaze the pan by adding a splash of wine, bringing it to the boil, and then scraping the base of the pan to collect all the tasty bits stuck to the bottom. Once the liquid has reduced by half, pour it into the crockpot containing the meat. 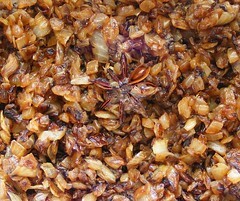 Remove the (bag of) star anise from the caramelised onions and then tip the onions into the crockpot containing the meat. Add the remaining wine and deglaze the frying pan. When the wine has reduced by half, pour it into the crockpot. Add the soffritto to the pot as well. 1. Bring a large pan of water to the boil. Fill a large bowl with ice-cold water. Make a cross with a sharp knife in the underside of each tomato. Blanch the tomatoes by dropping them into the boiling water for 10 seconds and then carefully removing them to the bowl of ice-cold water. Take them out of the water immediately and peel off the split skins. 2. Cut the tomatoes in quarters. With your knife, scrape/scoop/cut out the seeds, the membrane and the cores. Roughly chop the seeds and membrane, then tip them into a sieve over a bowl. Sprinkle over the salt and leave for 20 minutes to extract their juice, after which you can discard the seeds and membrane, reserving only the juice. 3. Roughly chop the tomato flesh and set aside. 4. Meanwhile, place a large, heavy-bottomed pan over a low heat. Add 100ml of the olive oil. Mince the garlic, then put it into the pan along with the onion. Cook for 10–15 minutes, until soft but not coloured. 5. Crush the coriander and put it in a muslin bag (or herb container), along with the star anise and the cloves. 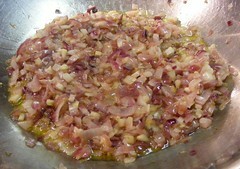 Add it to the softened onions and garlic. 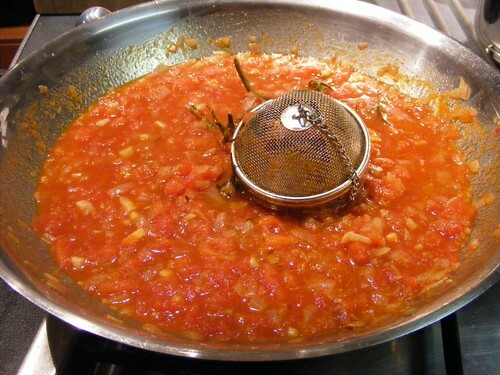 6.Take the juice drawn from the tomato seeds and membrane and add it to the onions and garlic along with the tomato flesh. 7. Add the Tabasco, fish sauce, Worcestershire sauce, tomato ketchup and sherry vinegar. Drop in the bouquet garni and cook over a low heat for 2 hours. 1. Stir the tomato compote (including the bag of spices) into the meat-sauce and cook over a very low heat for a final 2 hours, stirring occasionally. 2. Transfer as much sauce as you need this time to a baking pan and fry until all the excess liquid, as shown on the photo on the right has vapourized. Put the rest in freezer bags to freeze. 4. Put the spaghetti into the pan, give it a stir, then bring back to the boil and cook until the pasta is just tender but with a bite. Check the cooking time on the packet and use that as a guideline, but taste it every few minutes as this is the only way to judge when the pasta is ready. 5. Before taking the Bolognese sauce off the heat, check the seasoning and then add some sherry vinegar (tasting as you go) to balance the richness of the sauce. (I think I was too cautious here, I was afraid, after 3 days of cooking, I would ruine the sauce, hihi. Next time I will add a little extra) Add a generous grating of Parmesan (but not too much, as it can make the sauce overly salty) and remove the sauce from the heat. Take out the original thyme and bay bouquet garni and the bag of spices. Replace these with the parsley and tarragon bouquet garni, stir in 100g of unsalted butter and let the sauce stand for 5 minutes. 6. Once the pasta is cooked, drain, and rinse it thoroughly. Return to the pot to warm through. (Since the ragù is not going to be mixed with the pasta, it needs to be rinsed to prevent it becoming starchy and sticking together.) Add a generous knob of butter (about 50g per 400g of pasta) and coat with olive oil and the reserved oil from the final frying of the compote. To serve, wind portions of pasta around a carving fork and lay them horizontally in wide, shallow bowls. 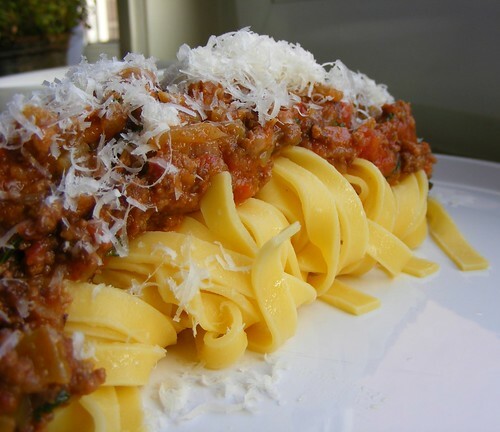 Top with the Bolognese sauce and finish with a grating of Parmesan. 7. Eat it! And serve the oaked chardonnay that went in it. I was quite surprised how well that combined. I really loved it. This entry was posted in Beef, Pasta, Pork and tagged Heston Blumenthal, Spagbol, Spaghetti Bolognese. Bookmark the permalink. Wow, I am really impressed! And I thought you didn’t like Italian food? Are you converted now, or are you so exhausted by cooking this you won’t eat spagh-bol any time soon? OMG…you must be very passionate about cooking to take 3 days to make this!!! Takes hat off and a deep bow to robin….Hmmpfff. Nope I won’t make this although I love reading and seeing your efforts and the result and I’m sure it was very tasty. That looks delicious. Real comfort food; if I had to choose Italian pasta or chocolate, it would always be pasta. Oh that’s just not fair. I came over here to get the recipe for the tomato soup I saw on Valeria’s blog, and I find this. Oh well, I’ve been meaning to get a meat grinder for a while now. I guess I’ll ask for it for my birthday. Also impressed, didn’t had the patience yet to make it myself. Just wrote about it (http://kook.rubriek.nl/eten&drinken/spaghetti_bolognese.php). But I think it’s fun. Well, at least when I was eating it. It’s always about the eating part, isn’t it? And Drew, if you really want to cook like your grandmother, I guess you do need a meat grinder, don’t you? Although you can always kindly ask your butcher to grind it for you. That’s probably what your grandmother used to do. But yes, I have a great local butcher. I usually let him do the hard work. But for some reason I *really* want to make my own sausage. Odd. ‘t Ziet er classy uit, petje af. Maar voor spaghetti bolognese gooi ik gehakt en daarna een groentenpakket in de pan, doe er knoflook en zout, peper en oregano en tijm bij in en een pakje tomato fritto van Heinz. Ik voel me nu een lazy cook hihi. Maar ja, IK heb geen 3 dagen tijd om een gerecht te bereiden. This recipe really puzzled me and I would never make it like this. It does not make sense, why the ketchup for instance. In his quest for the best pizza sauce Blumenthal went for canned tomatoes, why fresh here? I really liked the series but Blumenthal only pretends to be scientific about cooking. At heart he is an artist and that is why this recipe turned out so overly complicated I think. My guess for the ketchup is just to add some sweetness. It’s sugar with tomato flavour. Perfect for tomato compote, I would say. And I love it that he isn’t afraid to use such an ingredient. There is nothing wrong with tomato ketchup. I don’t think he pretends to be scientific about cooking. He literally says, every episode again, “I prefer to think of it as good old-fashioned cooking with a bit of science thrown in for good measure.” So yes, he is an artist and he does cook with his heart. Not everything needs to be scientifically explained. It’s still about enjoying a nice meal. And having fun inventing and preparing it. I have never heard of Heston Blumenthal but I think I would be quite intimidated if all of his recipes are like this. 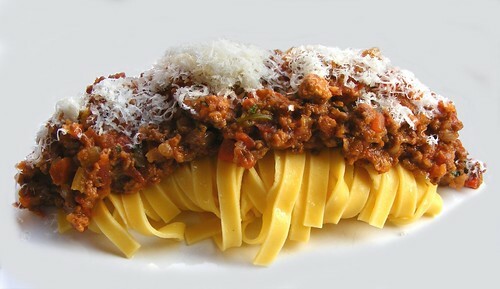 I can’t imagine spending three days on bolognese but your end result does look really good. I think I might just leave this one for a restaurant to prepare. Hey, I made this for the second time last night, easily the best bolognese sauce I’ve ever tasted. But can you give out any tips for boning the oxtail, its a NIGHTMARE! I tried for half an hour then gave up! It IS a nightmare. And I’m no expert, I only managed by perseverance, I guess. I couldn’t find any clips on youtube in english, but if you look at this one, even though it’s dutch and a lambshoulder, the way he is handling his knife is pretty much how I tried to do it. Just try to follow the bone with the tip of your knife. But my guess is you can easily substitute the oxtail with another cut of beef. Haven’t decided what piece though. I read a recipe a while back for quick spaghetti Bolognese in Cook’s Illustrated that used a mix of ground pork, ground veal, and ground beef in equal proportions. They referred to it as ‘meatloaf mix’. I’ve used it in my own recipe, and it always turns out great. Might be a good idea for those of us who don’t want to go to the trouble of boning & grinding our own oxtail. Three days to make bolognese!! It does look really good though. Also wondering whether you had Heston’s Chicken tikka recipe at all? I’m not a big spagbol fan, hihi, but that recipe looks nice too. I never tried Heston’s Chicken Tika recipe, I think that’s a typical english dish, I’m not even sure I ever ate that! I’ve been tempted to try his Peking Duck though. Or at least parts of it. You? I saw this recipe on ‘search for perfection’ a while ago, and I could of sworn that he uses a pressure cooker on the tomatoes at some stage… that was important as the higher temperature developed flavours that just can’t be made via normal simmering. But I don’t see any mention of that here…? I had the same “false memory” as you’re having, but it was with his perfect pizza that he used the pressure cooker to make the tomatosauce, not the spagbol! Thanks for telling me the youtubes aren’t working, I’ll try to find an alternative. Has anyone made his recipe that appears on the Times website? It’s far less involved than the above, though the basics are the same. Can use machine minced meat but the result isn’t quite the same, minced meat gets into small balls and knife cut gets into tiny filaments; much better. I save some time using a good canned tomato instead of fresh, and merging the process of the two sauces; I caramelize the onion, then prepare the meat sauce for 5 hours or so and add the tomato compote ingredients at that point. Everything can be done in about 7 hours or so. BTW, I got to your blog through your Bulli pictures at Flickr, how did you manage to get a booking? tried miself for 5 years in a row with no luck. I’ve been to Roca’s place a year ago and it was astonishing, they were also sooo nice. Have in plan to do Andoni Aduriz and Arzak this year. How I managed to get a booking at El Bulli? Well, we (my dining-friend and I) also tried for 4 years in a row and then suddenly after the fourth attempt we got an answer! Still can’t believe it sometimes, it was really unforgettable. The Roca-brothers were awesome too though! Their food was more delicious, El Bulli was more interesting. Both on top of my list. Conclusie: een erg zoete saus, met veel smaakjes, waarbij je wel proeft dat er aandacht en moeite voor gedaan is, maar die zijn doel wel een beetje voorbij schiet. Ik vond het namelijk wel leuk om te maken, maar had uiteindelijk wel het idee dat het sop de kool niet waard is. Een beetje “heb ik daar al die moeite voor gedaan?”. Maar goed, de ervaring rijker, en een oud voornemen (“de bolognese van Heston maken”) ingelost, kijk ik achteraf wel positief terug. En gaat de helft de diepvries in, want een ding is zeker: lekker was het wel! hi, I’m on day two of this recipe and all i can say is wow, if it tastes as good as it smells i carn’t wait for tonights supper. i didn’t cut up the oxtail but braised it until the meat fell off the bone…….i hope this will not afect the end result. I LOVE YOUR BLOG. Come on folks, he was making a joke.. wasn’t he? The most positive thing I can say about this absurdity is Bravo for using minced meats and not ground meats. It’s unfortunate that Hazan, whose recipe is otherwise pretty much definitive, missed what any good Italian cook knows, that ground meat in Bolognaise is like using fish sticks for a Sole Meuniere. Apart from that, he may have a constellation of Michelin stars, but any cook who uses tabasco and worcestershire sauces in public, let alone mixes them with chardonay and god knows what else, should hand in his toque. Forgive my bluntness, but anyone who reads this recipe and doesn’t burst out laughing is spending too much time thinking about food and not enough time tasting it. Lastly, “Check the packet for cooking times?” You spend all those hours on this sauce and you can’t find fifteen minutes to turn out some decent Tagliatelle? Bologna is the capital of Emiglia-Romagna after all. I think folks might ask..and who are you to make this critique? Mr. Blumenthal doesn’t have a “constellation of Michelin stars”. He has three and I expect that’s three more than you do. As for your demands of rigidity in culinary cooking..that’s a laugher. No serious chef, even the ones that wear a toque, would agree that you apply “rules” to an art. This dish was not made for Italians, was not made by Italians and was not made in Italy. Had you had bothered, you’d know that Chef Blumenthal’s objective is to perfect a dish, be it spag bol or an America burger..to British palates. Read his book before you write yours. The pasta that you use is tagliatelle and not spaghetti. Actually “Spaghetti alla bolognese” is a recipe that has never existed in Bologna since anybody “has” to use tagliatelle with ragù. Many say “It really looks good”, actually I would say “you mainly have to taste it, not looking”. When you are not allowed to cook things your own way, Gustibus, there isn’t much fun in cooking. And Blumenthal did it his way. Personally I don’t care what somebody does with a classic recipe as long as it tastes good, I’m happy. Maybe, sometimes you should then consider a different name, but not in this case. Let me tell you nobody would burst out into laughing when tasting this. It was the best bolognese ever. And I know the amounts look pretty dumb, but those are the amounts I used. I’m sure people can decide for themselves the amounts they’ll chop. That’s about the effect that ten drops of Tabasco and two spoons of ketchup might have on this bloated concoction. It’s like performing the St Matthews Passion with the addition of a slide whistle and a kazoo, just to be ‘creative’. Tabasco, for all its belovedness, is a vile mixture of stale peppers and cheap vinegar which has no business within fifty yards of a serious kitchen. In a pinch it can be useful in a lady’s handbag for personal defense. I still say he was joking. What a dull life it must be in your ultra-elite universe of what is allowed and what is not. Typ in het vakje “Titolo della ricetta” : Tagliatelle al ragù (inclusief hoofdletter en leesteken, anders doet-ie het niet). Helaas alleen in het Italiaans (maar ik heb laatst een Italiaans woordenboekje bij de vuilnis gevonden en zo is er wel uit te komen). Om alle recepten te bekijken: kies een Regione of een Tipo di piatto en klik op Esegui of druk op Enter en presto: ricetti! @Kees. Nah, dat doet mij dan weer niks, zo’n suf, zogenaamd authentiek recept. Nou,….zogenaamd. Deze is wel héél authentiek en van een zeer gerenommeerd instituut. In lijn met de opmerkingen van Kokend water en Gustibus over smaken die hun doel voorbijschieten en overcomplicatie, bevat dit recept – zoals de meeste Italiaanse – helemaal geen kruiden of knoflook (maar wel topklasse, zongerijpte ingrediënten) en door het ontbreken van rundvlees ie-ie ook niet zo zwaar en komen de andere smaken beter tot hun recht. Ik ben het volkomen met je eens dat iedereen moet doen wat hij / zij zelf lekker vindt, maar de purist in mij vindt dat je het dan een andere naam moet geven; je hebt er immers een ander gerecht van gemaakt. Can’t wait to make your version and see how it compares. Cool. Will you let us know how you liked it compared to the other recipes? Yes I will! Will try to make it this weekend. Can’t wait till 7pm (when it’ll be ready). Good luck, although I’m sure it will be delicious. Wow. You make your own minced meat. I love the way you photographed your Bolognese. Beautiful food! restaurateur in France.Just trying to Qualify my remarks.Certanly,I and think all pro cooks respect Heston,you could replace respect with envious,but I do think that Mr B. might,just might have been having a little bit of fun with us all! balls up,keep it simple,have fun and go for flavour but most of all cook for your guests not for yourself. Amazed that you managed this! I tried and failed at an early stage! I’m reading your blog and you really gave up easily, hihi. Heston spends weeks if not months coming up with the ‘perfect’ recipe, and then along comes someone that knows nothing about food “I don’t like carrots” & “I was already hyperventilating because of the amounts of oil and butter” and starts making changes to the recipe all over the place….recipes have been created to bring the best out of the ingredients, and quantities of ingredients used, change even one of these and it does not work, not without changing other parts of the recipe accordingly, which can only be done by someone that really knows what they are doing. Everyone gets into such a spin about this recipe. Yes it takes a while (probably not three days though) so it is a bit of a pain. The difference in the choice of spaghettis does make a difference, as does changing the meat ratio and you really can tell if you miss stuff out (we’ve done it four times now each time trying to simplify it and each time not quite coming up with the unique blend of immaculate flavours in the original. But above all, like all his recipes in that first book, it is without question the most amazing Bolognese you will ever taste. It’s all very well to go on about how great a cook they may be and how this is all a joke (ho ho) but if you don’t cook for a living then this is the only way you will get close to what Heston openly and honestly is aiming to help you achieve. Stick with it and ignore people who probably couldn’t even dream of turning out such delicious food from their ‘professional’ kitchen. I made a short-cut version last night in about three hours. I used ground beef and took terrible liberties with the compote, using half tinned tomatoes, half fresh and whizzed them up in a food processor. I also used dried thyme (*gasp* I know, I know – I’m out of control). The coriander, cloves and star anise along with the various condiments struck me as being the key elements. I also chopped to soffrito in a food processor, which resulted in quite a fine cut with the odd large bits that I picked out and chopped by hand – not ideal, but it wasn’t a disaster either. The final compromise was that I cooked each stage for about 40 minutes each, which was a pity to be honest. I kind of made this on a whim, which isn’t the idea at all. Although I unquestionably sacrificed some of the subtlety and depth of flavour with the reduced cooking times, we still enjoyed it immensely. Not perfection, by any means, merely very good. Yep – I invited a friend around to help finish it, and I still had a heap left over, which I’ve now frozen. I tried this yesterday. Took me all day but at a leisurely pace. I used whole pieces of beef and then shredded them after. This I thought was great. Didn’t actually change it too much but added some nice texture. I also (like Heston) didn’t grind the pork, also shredding that. I too used tinned tomatoes and my food processor for the chopping. It was delicious. I cooked the beef for 6 hours and the tomatoes for 2, then cooked together for another 2. I reduced the tomato compote by turning up the heat and ‘frying’ it, but I didn’t add much oil. Honestly, you don’t need it. Nor did I add the butter. My husband would have had heart failure if he found out I did! I made my own tagliatelle pasta and fresh basil and mint pesto to go on top. I have always done this to make my spag bol better. So I think this was the ‘perfect’ spag bol. The pesto just makes it even tastier and the flavors work so well together! Did you scim the fat off why part 1 was simmering. Hi guys! I’m Italian and i want to tell you that is not ragu’ and that’s not spaghetti alla bolognese! We are far far away from the original recipe! Also the ingredients are wrong. Try to search for spaghetti al ragu’ on an italian website if you don’t believe me! Couldn’t agree more about your comment about Italian kitchen. You made quite an effort. I would recommend getting a good professional quality mandoline with a selection of blades for veggies. You can make miropoix in a flash. Blanching, skinning and deseeding tomatoes is a pita, but I do that even for my breakfast omelet – there is no substitute for fresh tomatoes. Hi Robin, I have made the Times recipe once before (with heaps of shortcuts) but wanted to make it again and came upon your blog. I am going to give it a go because I really enjoyed it before, especially the leftovers that I could freeze. I think that if I make it a few times I will make my own personal version that doesnt take 3 days, does use ground meat and still tastes quite good. It is all about experimentation and tasting!!! After all everyones taste buds are different (and i wont add all that oil). Shocking I know to all those food snobs. Loved your post and the effort that you went to. It didn’t take me 3 days, like 72 hours! I did it once again later, with minced meat, blitzing the vegetables in the kitchen robot, using tinned tomatoes and not making photos of every step. Much faster and practically just as good. I keep “forgetting” to make some more, but you’re right, it freezes brilliantly. Kathy, I normally make half the above – you’ll have ample for eight if you do the the full recipe and plate it like the pix here. Even with half I have enough to make a reasonably large lasagne with after. Heston himself states that his “In Search of Perfection” is subjective to him. It’s his idea of a perfect spag bol, not ragu bolognese and for most people with a non Italian backgroud spag bol is simply ground meat in red sauce. So with his own nostalgic memories, his own personal preferences and some inspiration from a true ragu bolognese, he’s crafted what he thinks is the tastiest spag bol. He wasn’t going for the most authentic or classic, he made what he liked. Also, the oil in tomato step is important. You are essentially making a tomato confit. Think of it as “essential oil of tomato”. It will taste incredible and you can save it to add to sauces, soups, and dressings or simply toss it in some plain pasta with basil. If you’re worried about how healthy it is, use good quality oil, remove all of it and add as much or as little as you like. He doesn’t say you have to drink it all at once! The purpose in creating this dish, for Mr. Blumenthal, was to “push” one of Great Britain’s most popular dishes to it’s limits. To perfect it for British tastes. No one, including him, ever said it was authentic Italian ( which there really isn’t ) Bolognese. With that in mind don’t make this unless you like to cook, love your kitchen and want to pursue as Mr. Blumenthal did, perfection. No short cuts ( every step is calculated ) or substitutions ( every ingredient is essential ). When you are done you’ll have a wad of delicious food. But it stays well in the fridge and the last time I made it I used some of the ragu for a lasagna and it was wonderful. At the bottom of the ragu pan you’ll find a rich brown fluid. DO NOT pitch this. It’s heaven in just about any application you put it to.